Starbucks holiday cups -- which, to be clear, are just receptacles for caffeinated liquid -- have taken a weirdly prominent place in the American culture wars in the last few years. People like that they're red, people hate that they're red. It's better not to think too much about it. 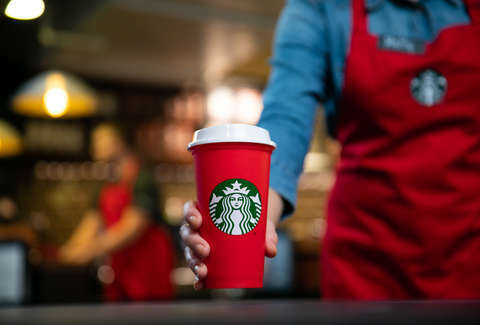 There's a new controversy this year, however, and if you were planning on getting one of those new, reusable red cups that get you holiday drink discounts, this particular uproar is actually worth thinking about. The coffee behemoth started handing the limited-edition plastic cups out on Friday, saying they were available while supplies last, and it turned out that supplies did not last. The public was not pleased. The idea was that customers could bring the reusable cups back in after 2pm from November 3 to January 7 for a 50-cent discount on grande holiday drinks. Starbucks customers who were ultimately denied this were pissed about the money they won't be saving. But mostly they didn't want to be left out of the joy of owning one of these red, red, red cups. And, like all those who are deprived of joys they feel entitled to, these disgruntled Starbucks fans took to Twitter. Some claimed that stores ran through their supplies in minutes; all demanded that the blood debt be repaid. Went at 7:45am, and they were already out. Was this a scam???? Eater also points out that if you bring your own disposable cup in, you can get 10 cents off year-round. But we suspect this is more a matter of principle.